Please note, the author of this post is not as glamorous as Joan Crawford. I have been trying to write a novel for two years. I have the idea, but I am not very disciplined. Luckily, my friend Jo is better at this stuff than I am and has had loads of success with her writing- and is one half of Writer’s HQ. She suggested that I try one of the monthly writer’s retreats held around the country. Through writing sprints and goal-setting (and gold stars), the retreats aim to help you unlock your potential and get something down on paper/screen. I bumbled up with the aim of a thousand words and a short story submission for Mslexia magazine. Within an hour, I’d smashed both of those things and started working on something that could later be a novel. By the end of the day- which is also filled with a great lunch and generous servings of tea and cake- I’d written 6,500 words, earned three gold stars AND had loads of goes on the giant indoor swing. The atmosphere was supportive and no-one read their work out, which was a relief. We all had different goals: writing short stories, plays, screenplays, pitches; editing. I’m pretty sure all of us left with a sense of accomplishment. And everyone was so nice! In the breaks, we chatted about books, babies and all sorts of other things. If I didn’t have pesky commitments (a child and a husband with a Brighton season ticket), I’d seriously be there every month. Since going, I’ve found a way of working in twenty minute sessions that’s way more productive than trying to work for a solid hour (I can write 1000 words in two twenty minute sprints, whereas a full forty minute session would probably be mostly me pratting about on Twitter.) And although I have yet to get into a solid, regular writing habit, they have a free online course starting in a couple of weeks which I’m signed up for. I’ve previously completed their Seven Ideas in Seven Days course (review here), so I am DETERMINED to finish this bloody novel, mainly because I’d like my brain back for a bit without the characters taking over. It’s also worth mentioning that you can try all of the courses free for seven days and then sign up for full membership if you want. I can also highly recommend the Writer’s HQ Facebook groups for support, even if I did accidentally make someone cry with a piece I put on there. So go forth and write. Join a retreat and have fun. I’ll buy your novel at the end of it. I am not a natural dancer. My hearing isn’t brilliant, so I can often miss the beat. I have the hand-eye co-ordination of a sloth who has had too much caffeine. I certainly don’t look like a dancer. But that doesn’t mean I don’t try. I mean, I watch Strictly! I know the names of certain dances! I have certainly tried very hard in the past to be a dancer, although I came to it quite late. Much to my mother’s despair, I was never interested in ballet and she never forced it on me (I was much more your dinosaurs-and-motorbikes kind of girl as a preschooler.) But later on, a relatively well-known dance company came to my school and, desperate not to be the pudgy, badly bullied girl with a bad haircut I was, I signed up. I was good at Drama and thought I could put aside my self-esteem issues and become A DANCER! I tried so hard. I went on the outing to the dance studio. I went to see the dance company perform. I can’t actually remember if I performed. Maybe I’ve blocked it out. Oh, I was so bad. I was awkward, from being a teenager. I was awkward because I was picked on by the girls who took to dance more naturally. But by Jove, I can still remember that ridiculous dance and I could still probably perform it, although having gone through puberty proper and childbirth since, it’d be quite a tricky ask. And a few years ago I used my Christmas money to sign up for jive lessons. I loved it. For about three weeks until I discovered I was pregnant and then my life became one of nausea and exhaustion. I still can’t hear ‘Rock Around The Clock’ without my feet beginning to shuffle though. I never dance in public- I haven’t been to a club since the Romans were being chased around Anglia by Boudicca- although I’ll have a quick mum-shuffle round the dancefloor at a wedding if I’ve had enough gin and the buffet has had enough vegetarian food to keep me going. I love dancing. But dancing with others is not my passion. No. My passion is dancing around my kitchen, by myself, flailing to something probably from the 80s. Imagine me, dear Reader, only this evening throwing myself about to Bowie’s Modern Love and Wham!’s I’m Your Man, dressed in leggings and a man’s jumper thrown over a dress that resembles a scandalously short monk’s cassock. I looked ridiculous- but I was happy. Goodness knows, the world is an unhappy place at the moment. My mind is an unhappy place a lot of the time and my body- well, that’s a battleground all of its own. But when I am enthusiastically throwing myself around the ground floor of my house, music turned up, safe in the knowledge that no-one can see me (save my son, who may or may not enthusiastically join in by spinning on the spot so much that I have to boogie away from him in order to not feel sick myself.) It feels good. I’m not judging myself, no one else is judging me; I’m not really thinking. If I did, I’d probably be horrified by the ‘shapes’ I’m ‘throwing’. But it’s my kitchen, my music. I love it. Afterwards, I know I’ll feel tired and a bit daft, but I’ll also feel euphoric, even if only for a bit. I won’t change politics, I won’t change the things that stress me out, but I will have a break from them. Ultimately, it’s an escape from my own brain and that is always welcome. I’m not one for a ‘new year, new you’, because quite frankly it’s nonsense. But a quick dad dance round the kitchen to old-school Kylie? Sign me up. I was also able to think about a few things, make a few decisions and just generally get some head space. I’m not promising a rigid posting schedule- I don’t think it helps- but I will be posting here when as and when I feel like it. So yeah, I’m back (again)! How’ve you been? 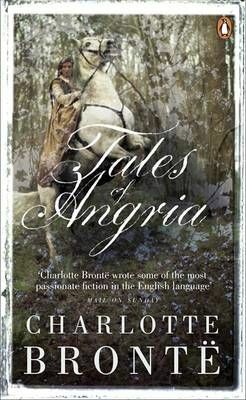 I’m a month into The Bronte Project- I’m currently reading Juliet Barker’s The Brontes, which Benn referred to as ‘a weighty tome’ (and it is- it’s 800 pages before you even get to the notes) and an edition of the stories Charlotte wrote, in conjunction with her brother, called Tales of Angria. I thought I’d list the editions I’m using- although I have a couple of vintage editions of some of the non-fiction, which I’ve listed a newer version if you want to read along with me. None of these links are affiliates, by the way! The Life of Charlotte Bronte- Mrs Gaskell My edition of this is from 1905, so I will probably borrow another edition from the library; I can’t remember if the print is tiny in my book. Charlotte Bronte- Claire Harman This will be another book I get from the library. This is not meant to be an exhaustive list by any means! However, it’s a good resource for anyone who might want to read along, or to dip in and out of Bronteana in a year which is important for Bronte readers and scholars (it’s the 200th anniversary of Charlotte’s birth.) Let me know if you have any thoughts, recommendations or if you’d like to read along with me! As I’ve got older, I’ve found that my musical tastes have grown into a very broad spectrum (I could probably name you a song I like from most genres, except maybe prog rock and experimental jazz- I’ll leave those for Benn) and I always, always have an earworm on the go. The first song I hear most mornings, because it’s both my alarm and my ringtone, is Oliver’s Army by Elvis Costello. This morning, this was replaced in my brain by Mellow Yellow by Donovan, which is the last song on the Minions soundtrack- I’ll let you guess why that might be. No matter that the film itself is a bit daft, the songs on it are pretty good (the action takes place in London in 1968, so it’s got some great Swinging Sixties classics.) I did drive myself quite mad with this one. I started the weekend thinking-sadly- about music, as I watched Amy on Channel 4 on Friday night. I’d never seen it before, but I remember how profoundly sad I felt when she died; I’d always been rooting for her and it was just so tragic that she could never fulfill her potential. Although everyone always goes for the classics- Rehab, Back to Black- I’ll always have a soft spot for heartbroken but upbeat Tears Dry On Their Own. I got a few albums for Christmas, which is unusual. My current favourite is Leon Bridge’s album Coming Home. It has a really old-school, Sam Cooke/gospel feel to it which I love. It’s replaced 1989 as my current most-played album. Speaking of Taylor Swift, I also got Red for Christmas- so 22 is never far away from being hummed at some point in the day. We’re baaaack. After a quite frankly disappointingly conservative set of showdances (seriously, where was the Lycra? The high-wire stunts?) and slightly uninspiring judge’s choices, it was quite clear that unless there was a major shocker, Katie was going. Still, at least Anton got his ‘journey to the final’ narrative this series. I’m not 100% sure why they’ve picked this- it’s nowhere near their highest scorer and I think that most people (myself included) would have preferred their jive to have been revisited and they did say that they wanted something they wanted to improve on. This was definitely a brilliant paso and SO powerful. Throughout the series, Jay has made dancing look so effortless and stunning- those shapes he can make with his body are just mind-blowing. (Also, fun fact- my mum is not a Strictly viewer, but she’s sat through it with me tonight and has turned into a rabid Jay fan, which is quite fun.) CRAIG! WHY NO TEN?! Gah. I loved this Charleston first time round- it was (is?) the highest scoring Charleston of the series and was when I think Georgia really started showing what she was capable of. Of all the dances tonight, this is the one that scored the highest on its original outing. Again, it was light, bouncy and fun- and was a brilliant dance for Georgia to end her Strictly experience on. Oh, very clever. Do your Star Wars themed dance the weekend a certain small, low budget movie opens. This surprised me when I first saw it; I remember not being certain that it would work, but it did. This was definitely sharper than before and just as much fun. (I still think that raucous Viennese Waltz is my favourite of Kellie and Kevin’s dances, or their beautiful Fred ‘n’ Ginger routine from last week.) OH CRAIG. AGAIN? I’d be quite happy with whoever wins, tbh. And the winner of Strictly 2015 is….. JAY! (I definitely said he was a dark horse from the start.) I am so pleased, but also sad for the other two, who I liked equally well. It also shows, too, how the judges and the voting public can veer wildly from each other. So we’re done. After spending HOURS writing up this blog- roughly about 15,000 words worth of typing- and being a general smartarse on social media, I can’t quite believe it! I’m not sure if I’ll do it again next year, but it’s been a lot of fun.